My kids were thrilled with this as soon as it was out of the box. It’s fun to play with, for what it does. It only does basically one thing though, so don’t expect it to be a longstanding favorite toy or anything like that. 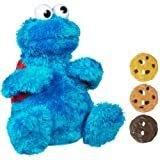 You feed the cookies into Cookie Monster’s mouth and he provides some commentary (including a loud burp). The cookies then pass into his backpack, and when they are all there he hints “maybe more cookies in backpack?” Fortunately it’s not all that loud, so the annoyance factor for parents is pretty low. Any alleged educational value is severely overstated. I mean yes, you can count that there are three cookies, and I guess you could count how many times he eats then and then deposits them in his backpack, but…yeah there’s really no educational value. They will definitely be bored with this toy by the end of the week, if not sooner, but for right now it’s a hit. Accordingly, I think this toy would be best at a grandparent’s house or in a waiting room or something, where it can captivate for a short time as needed and be put away and revisited later before the novelty wears off. I’ve always loved Cookie Monster. This gave me the opportunity to introduce him to a younger generation! : We opened the package and I was happy to find that it included batteries. Always a happy surprise. I have to say that it kept us intertained for maybe 5 minutes. The cute giggle noise made by pressing his feet was more intertaining than the 3 cookies. It’s an adorable toy though so it has earned a spot on the beloved toy shelf that we like to look at but really don’t play with too much. This toy is said to be for children 18 months – 4 years…and while it is certainly appropriate for those ages, my 7 year old is in LOVE with this toy! The packaging is great! Easy to remove toy from packaging and there is minimal plastic used…it was all cardboard and string. I didn’t even need scissors to get it open! Very easy. The design of the toy is remarkable. The cookies it comes with are all stored in Cookie Monsters backpack. He eats them and they automatically go to the backpack for easy storage. The only time they fell out of the backpack was when he took a tumble down a hill. None of the parts are small or dangerous in any way for smaller children. He is durable and sturdy! Cookie talks…counts…and sings. His voice is the traditional one we are all used to hearing…and he’s so sweet!